Following the groundbreaking success of Pulp Fiction came a wave of lesser films attempting to replicate that formula. Crime sagas with layered timelines, interlocking narratives, and eccentric characters were everywhere. With few exceptions, most of these endeavors fell flat. 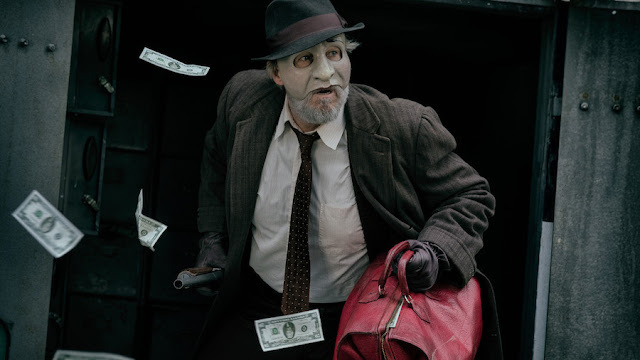 Bad Times at the El Royale, the latest from Cabin in the Woods director Drew Goddard, could easily be one of these movies. Clocking in at a brutal 141 minutes—every second drags—Bad Times manages to be both overstuffed and underdeveloped. Goddard, who also penned the script, takes up the classic setup of a collection of strangers trapped in a single, isolated location, each hiding a dark secret and running from a hot-on-their-heels past, and forced by circumstance into each other’s orbit. 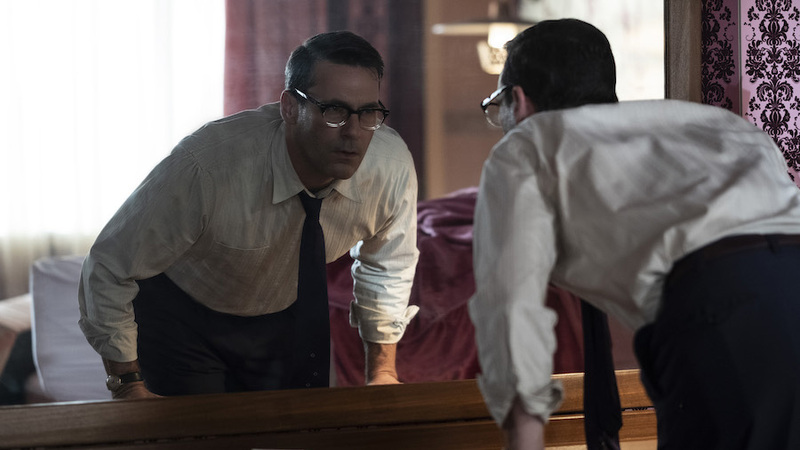 Set in the Nixon era, there’s the fast-talking vacuum salesman, Laramie Seymour Sullivan (Jon Hamm); the aging priest, Father Daniel Flynn (Jeff Bridges); a guarded hippie, Emily Summerspring (Dakota Johnson); the meek hotel clerk, Miles (Lewis Pullman), alone in his duties; and struggling singer Darlene Sweet (Cynthia Erivo). 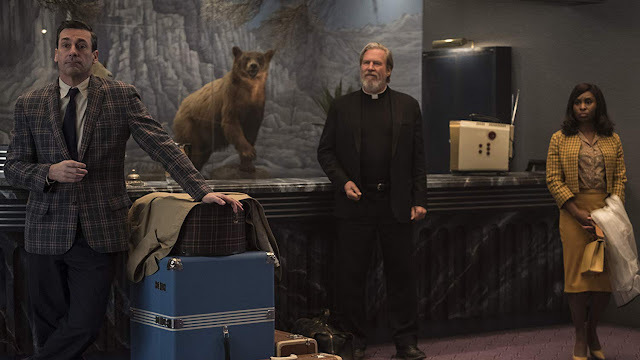 These folks, and a few others best left unmentioned for the time being, end up at the El Royale, a ramshackle Lake Tahoe hotel, a faded star that spans the California-Nevada border and harbors a few secrets of its own. Part of what makes Cabin in the Woods such a joy is watching Goddard toy with genre conventions, tweak them for his own purposes, and subvert expectations. If you hope for more of the same in Bad Times, you’re in for a disappointment. It hits all of the markers—no one is who they seem, the plot overflows with noir-ish twists and turns, sudden violence lurks around every corner—but does nothing interesting with them. Individual scenes and moments are clever and staged in intriguing ways—one scene using Darlene’s soaring voice to mask other endeavors stands out—but they never press any deeper. It’s all surface level stylistics, posturing, and bluster. There’s a lot going on, but Bad Times never fleshes anything out or connects with the audience. Which extends to the characters. We’re supposed to believe these people are desperate and driven, haunted and hunted, and while the plot mechanics show us that, we never believe it and they lack even basic levels of humanity to cling to. Johnson is a hoot as the tough-as-nails hippie on the run, but never sells the emotional kicker. Hamm was born to play the fast-talking huckster, but it’s all wind and talk, no substance. When Chris Hemsworth arrives on the scene—I won’t mention much about his role—all shirtless swagger and clearly having a blast, it’s still all show. Even Darlene and Father Daniel, ostensibly the heart of the film, ring hollow—Darlene offers little more than being sad because the music business is hard. I honestly think what happens is that Goddard purposely leaves things vague and uses hints and subtext to convey meaning and depth but misses the mark horribly. He just whiffs, like JV player in the batter’s box against an MLB pitcher whiff. The result is obtuse instead of oblique; instead of creating mystery, tension, and intrigue, it manifests distance and erects a barrier between the story, characters, and audience. What mystery there is, too easily finds answers, in swaths of expository dialogue. No one ever really investigates, explanations simply arrive. Except for big, looming red herring questions, like who runs the El Royale and what their endgame is, and the identity of a famous man on a reel of film that’s passed around. Those remain unsolved. They function the briefcase in Pulp Fiction, only not particularly intriguing or effective as a device. 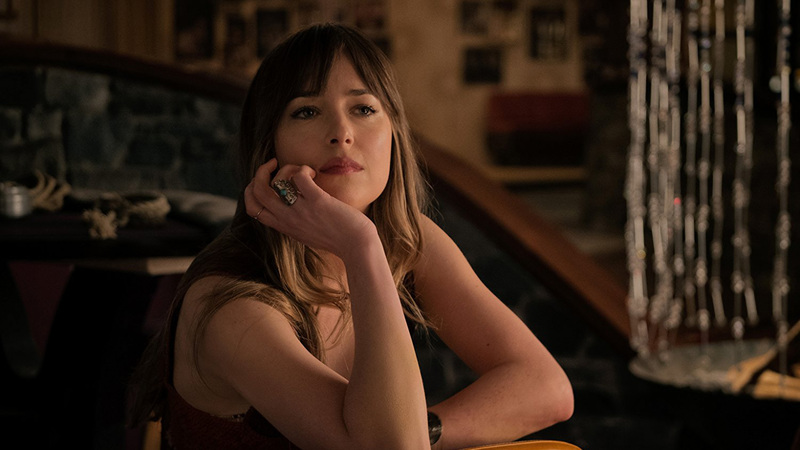 Bad Times at the El Royale has an admittedly killer soundtrack full of everything from old school soul and doo wop to psychedelic stoner rock, even though the plot often functions as little more than a strategy to get from one musical moment to the next. And Goddard channels his inner Douglas Sirk, using mirrors, windows, and doorways to frame the actors and action within the frame—as well as his penchant for two-way mirrors. Thematically, Bad Times shares similar concerns as Cabin. Ideas of gods and the destruction they wreak, albeit from different angles, permeates the latter portion, as do attempts to critique the damage toxic masculinity does to everything and everyone caught up in its expansive grasp. Or, as Darlene offers, men who talk a lot, enough that they think they believe in something. But like most of the film’s other elements, this, while potentially captivating, offers little substance to back it up.